Dated June 21st, 1788, The Founding Fathers created the third chapter of the American Social Construct, the United States Constitution, for YOU. By federal law, the Constitution creates, defines, and establishes your ownership of the nation, as well as your management of the employee government that works for your benefit. The employee government includes all government employees and elected politicians, because they are all paid with your hard earned tax dollars. ​Understanding this concept is the key to realizing that you are not just a Citizen, you are an Owner and a Manager of this country. Limited Government – This principle restricts the Government’s activities to its most essential functions: To preserve individual liberty, protect private property, defend your nation, and enforce federal law. The government must be conducted according to the principles established in the American Social Contract, and the government and its employees are always subject to, and never above the law. The same federal law that gives you ownership rights, powers, and privileges. 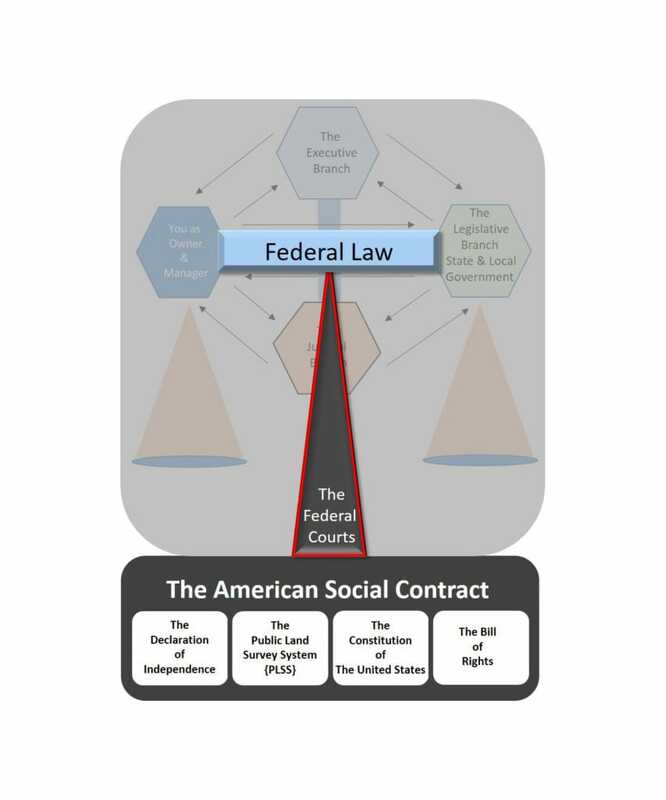 Separation of Powers – This is the principle that the three individual branches of the employee government, plus the Owners have separate and unique powers and responsibilities. However, they cannot interfere with the other parties or do the others parties’ job as defined by the American Social Contract. Checks and Balances – This is the principle that allows limits to be imposed on the Owners and all of the branches of the employee government. This is intended to prevent the passage of any law or the implementation of any policy that would breach or violate the terms of the American Social Contract by any of the parties subject to this contract. Judicial Review – This is the principle that the federal courts have the power to determine the constitutionality of the policies, laws, or actions of the executive and legislative branches of government, the Owners, or the individual government employees. However, the construct does not say that the courts can over-rule Popular Sovereignty. Federalism – This is a system of government in which power is divided between a central authority and constituent political units; like national, state, counties, cities, school boards, and neighborhoods. By the Constitution, all are required to uniformly enforce federal law in every jurisdiction of this nation. ​However there is clear evidence that this is not enforced today, in violation of the citizen owner managers civil rights. OwnerManager.org asserts that there is a seventh basic principle. This is obvious by the terms and basic construction of the American Social Construct, but some of the employees do not like it, so it has been overlooked and even circumvented for many years. Accountability should be number 7– The Founders established that the enforce-ability of the American Social Construct by you, the Citizen Owner Manager is a critical Check and Balance on the employee government. This principle allows you to hold your government and all of its employees accountable for their actions, in federal court if necessary and in your court of public opinion. ​Accountability is also an obligation on the Citizen Owner Managers to organized. It is obvious by the terms and the basic construction of the American Social Construct that the Owners must be able to participate on an equal footing with the employee unions aka political parties. ​The Employees are very organized but, the Owners are not well organized. However, you are the first generation of Owners to have the internet, social media, and now this patented web site. But, even OwnerManager.org cannot build an on-line community and force you to use it. OwnerManager.org cannot build an on-line community and hope that you will use it. OwnerManager.org can only ask you if you to help build this community for us to use together. You are this important to the future of America. Citizen ​Owner and a Manager of this country. The Constitution does not stand alone. There are two fundamental elements that precede it: First, the Declaration of Independence is the moral intent of the American Social Construct. The Declaration of Independence defines the first right and the first duty of each American: “To Make It Better” [National Treasure]. The Declaration of Independence also establishes the ultimate authority of your popular sovereignty through the online vote of the Citizen Owner Managers. ​The second element of your American Social Construct is the Public Land Survey System (PLSS), which provides the social framework for America by defining a non-discretionary system to establish domestic peace and harmony between neighbors and nations by making permanent boundaries, and provide a process to pay down your national debt. ​These two fundamental elements help form the moral intent and the contractual framework onto which the Constitution and the Bill of Rights are constructed. ​Together, all four of these elements form the American Social Construct, the foundation on which your nation has been built. 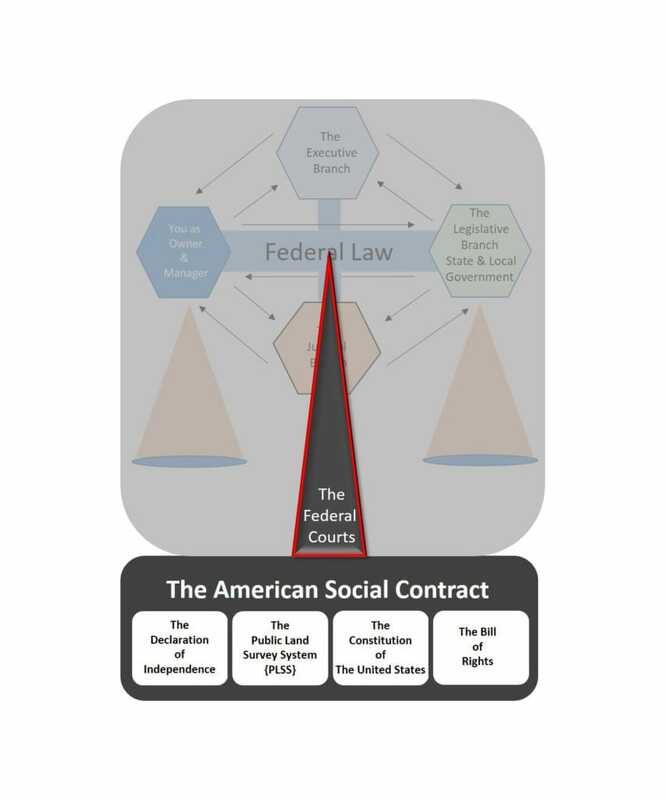 Simple rectangle graphic showing the four elements of the American Social Construct as a foundation or a base to build Democracy upon. 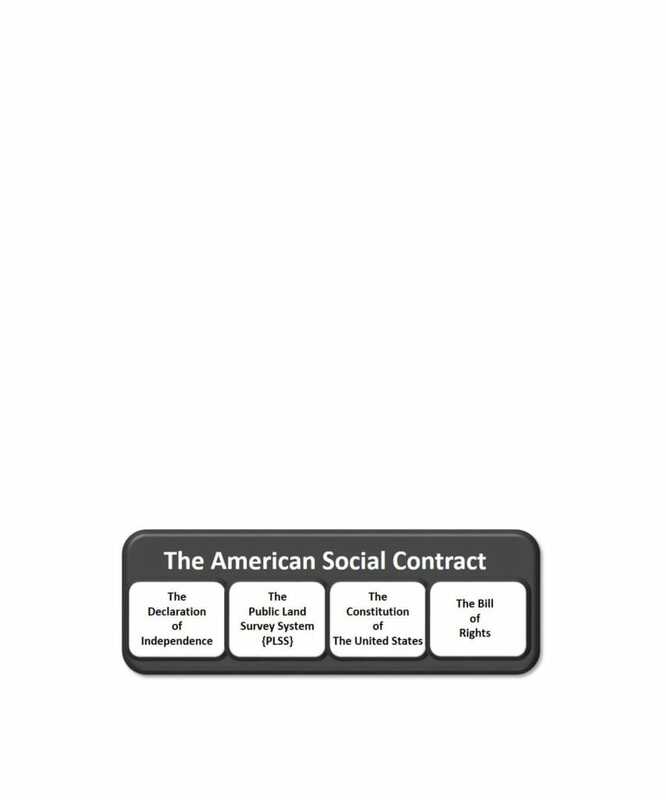 By the terms of the American Social Contract, this image symbolizes you, a Factual Citizen Owner Manager. However, there are two groups of Factual Citizen Owner Managers represented in this image. ​They are the Factual Citizen Owner Managers who invest in America by purchasing public land use patents. These land use patents are governed by the non-discretionary terms of the PLSS, and they are a product that can help pay down the national debt. The second group are the Factual Citizen Owner Managers who do not invest in this product. Both groups are equal in the eyes of federal law, since each are Factual American Citizens; and both have vested constitutional civil rights, as well as vested contractual ownership rights under the American Social Construct. We the People are combined into one image, as the Factual Citizen Owner Manager Investors of this country as set forth in the American Social Construct. Simple octagon graphic with a second octagon inside it that depicts both types of American Citizens, investors and non-investors, sitting on the foundation of the American Social Construct. Since the Constitution is an element of this larger social construct, all factual citizens have enforceable contractual rights, powers, and privileges; both as tax-paying Owners, and as Managers of this country. In fact, the Constitution and the Bill of Rights establish that all, both kinds, of your civil rights can be enforced in the federal courts to preserve, protect, defend, and fulfill the terms of the American Social Construct. ​By federal law, statutory rights are “real property”. This is your possession to claim, by right of inheritance, under the federal law established in the American Social Construct. These solemn compacts were meticulously assembled by our Founders Fathers. They constructed a safe harbor to anchor the faith of the nation in the rule of federal law by the application of the seven basic principles we have already reviewed above. As defined in the Constitution, this is a diagram of the three branches of the American employee government. It shows how each branch officially communicates with the other, and is a brief outline of the limitations of each branches’ authority. ​The diagram also outlines the responsibilities of each branch and how they are organized. 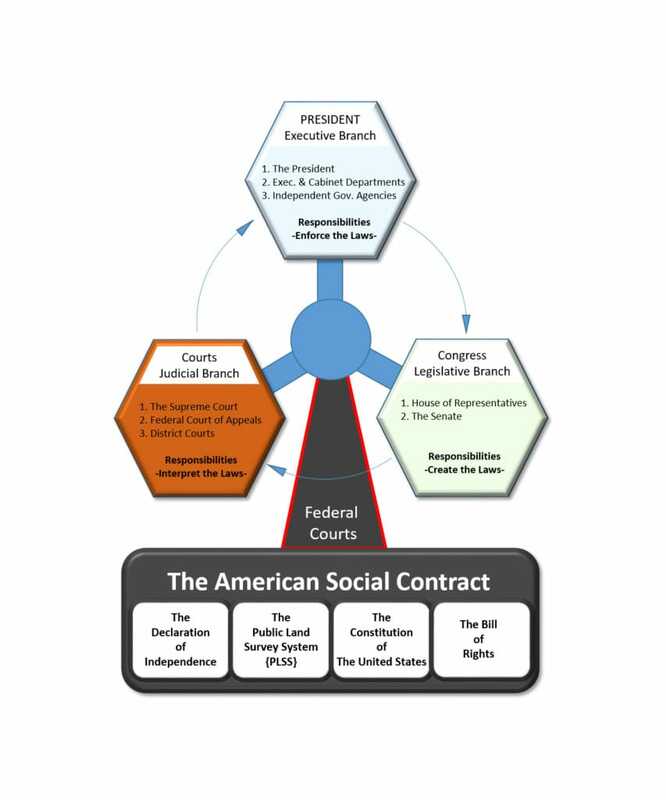 Reading the details shown in this diagram will help you understand how the laws, the policies, and the actions of your employee government can be tested by you, the Owner, in the judicial branch. As they may be deemed unconstitutional if they violate your ownership rights, your civil rights or breach the intent or terms of the American Social Construct. But where are you shown in this diagram? The answer is that you are not shown! This image symbolizes what is happening today. The government is running in circles. Your government employees are out of control because something is missing. You are that something. 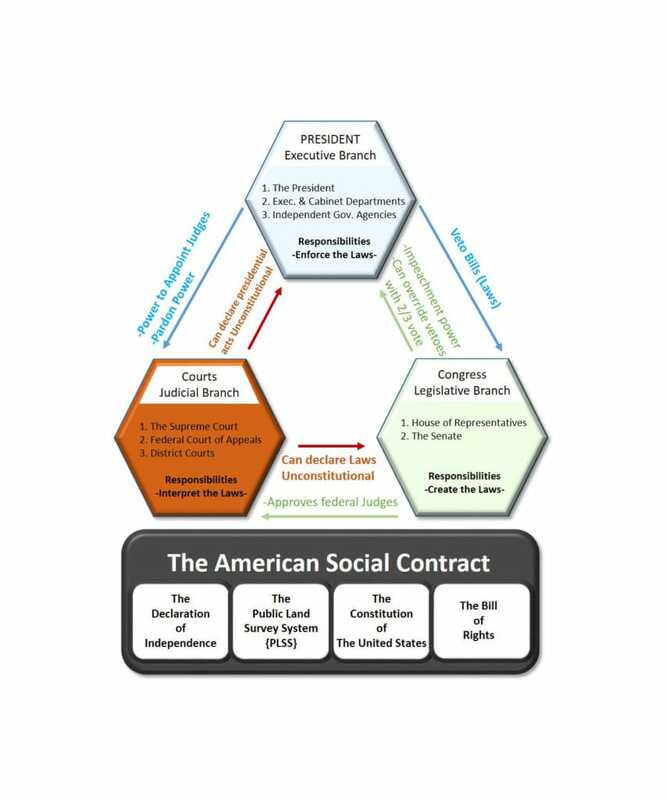 You are the central part of American democracy, the Owner, but where do you fit into this diagram of the American Social Construct? Without you, the politician employees don’t know what to do. They work for you, and you pay them (with your taxes). You simply want them to do the job they are paid to do, and be held accountable if they do not. ​But that means you must be actively involved in clearly telling them what you want done and how you want it done. Because you are the Owner and the Manager under the American Social Construct, it is actually your part, your role, your opportunity to make America Better. You are this important to the process today and the future. 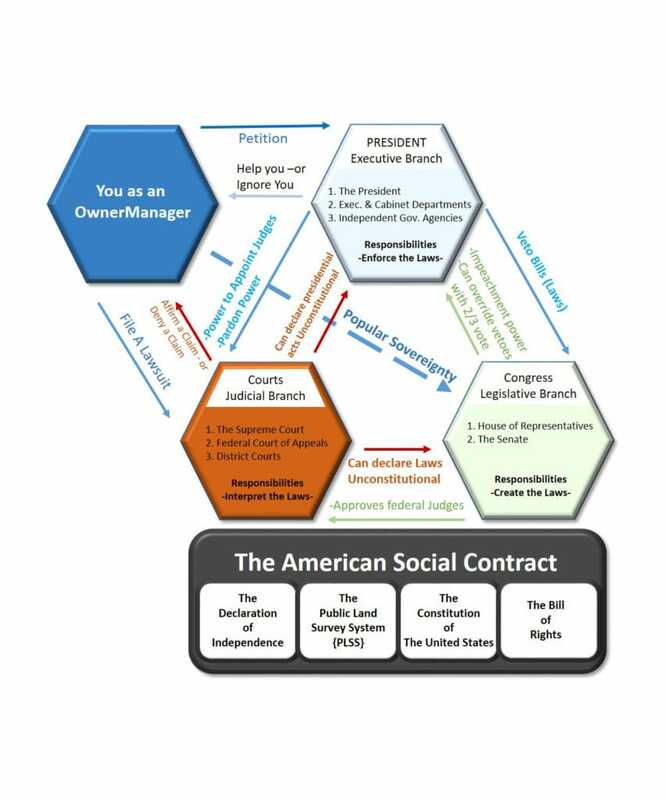 In this diagram, you are shown as an organized active Citizen Owner Manager who has claimed and taken possession of their ownership rights and privileges as defined by the American Social Construct. Now, you can interact with your government in a new way. ​There are many things that you can now do, and you can do them in a more efficient manner because there are no political employees interpreting what you want done. You are the Owner Manager and now you can directly participate in the control and management of your nation, like never before, because you have organized and you speak with the clear voice of consensus on the issue, whatever it is. Still, this diagram seems clumsy and it appears to be out of balance. A basic principle of the American Social Construct is that there are always Checks and Balances, which allows the government, its employees, all elected politicians and the Owners to be held accountable for their actions on the issue, whatever it is. ​These Checks and Balances help us find and implement policies that make America better. This time we will add everything we have discussed because each part is very important. The American Social Construct is the foundation. The Federal Courts! They are what separate a civil society founded on federal law from a dictatorship. ​As the Owner in a lawful construct with employees, the Courts are critical. 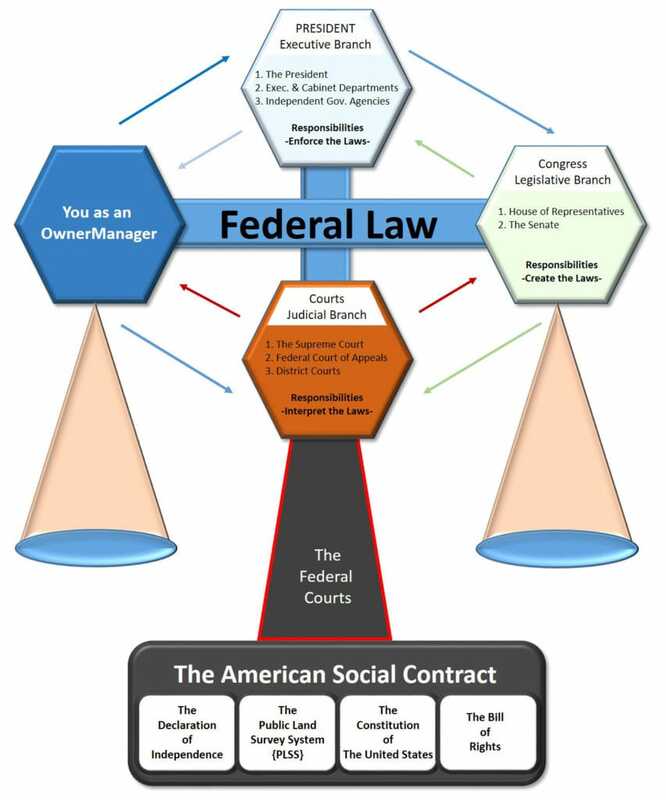 The duty of the federal courts is to impartially balance federal law between you, the OwnerManager, and your employee government to fulfill the terms of the American Social Construct. Therefore, the Federal Courts can be your ally in managing your paid employees. They can help you lawfully manage your employees, it's their job. The job you, the Owner, pay them to do for you. However, the courts have no authority to over-rule the Owners Popular Sovereignty. Now, this diagram looks balanced and functional. It appears to be ready to weigh the actions of your government employees by the intent, the terms, and the conditions of the American Social Construct with you organized and involved. It appears ready to weigh each issue that effects your nation. This diagram appears to make America better and more efficient. This diagram shows the direct result of you publicly claiming your contractual and constitutionally established ownership rights on this website, and intentionally changing your relationship with your government and its employees. But you are the Owner and only you can make this change happen. Understanding these concepts is the key to realizing that you are not just a citizen, you are an Owner and a Manager of this country, and a very important part of American Democracy! The question is: Now that you know. What are you going to do? The fact is. You are not an Amer i can’t. You are an Amer I Can. We suggest that you should get our cans moving to Build America Better Every Day. ​As Owner, it is time for you to act, now that you know. Now use this Quick Link to go to the fourth element, the Bill of Rights.